Or read on to the end of the page…. 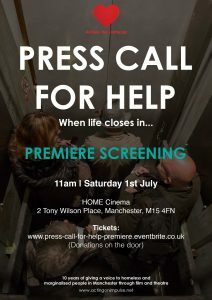 Finally we settle down in comfortable cinema seats at HOME to watch our film Press Call for Help along with James Statham’s Behind Scenes documentary. Months of acting workshops, 3 days of filming with a great director Jamie Shelton and weeks of intense post-production activity steered by our indefatigable Producer Luke Filz. And wow, this was the best 10th anniversary gift we could have asked for. The industry professionals did us proud. From the minute the lights went down, the brilliant graphics and sound plunged us straight into the hot scary atmosphere of a stalled lift. We sweated it out with the 4 trapped passengers and journeyed back with each of them in turn to the hellish day that they had just endured. Press Call for Help is riveting contemporary drama that somehow began its life in workshops with an exploration of the fairy tale Rumpelstilskin. Hats off to Artistic Creator/Producer Rachel Muter and Sarah Lee for unleashing such creativity and inspiration in our actors. The acting was just superb, they are true professionals. The Behind Scenes doc captured something of the fun and hard work that went into the 3 days of filming and introduced our secret star – Art Director Paul Kondras’ stunning lift. Study it for yourself and try and tell the difference between a real lift and our studio-based earth bound one. Some of our actors surprised and delighted the audience by popping up all over the auditorium with a sketch based round going to the wrap party –via a lift of course. Two of our actors were interviewed about their experience of Acting on Impulse, very frank and moving. And Director and good AOI friend Garry Paton interviewed founder Lauren Pouchly, against a nostalgic background of film clips from our past films. The event was topped off with a splendid celebration lunch for cast, production and supporters at next door’s STREET ON FIRST restaurant at the Innside Hotel. A huge success and we are so thankful to the many people who took part in helping us get the film to the big screen.